DIE Martis, videlicet, 3 die Maii. Mr. Clark to be Minister of Stisted. Bill for exempting the Four Counties from the Marches of Wales. Captain Stanley, Mayor of Maidstone, released upon Bail. Lords added to the Committee for disposing the Money gathered for the poor Irish Protestants. Proceedings against Sir Philip Manwaring in Mr. Steward's Cause respited. Sent to the H. C. with some Amendments for their Concurrence. Message from the H. C. with an Order for 2000l. to Sir John Hotham for Hull. Message from the H. C. for a Conference on the Bill against Pluralities. 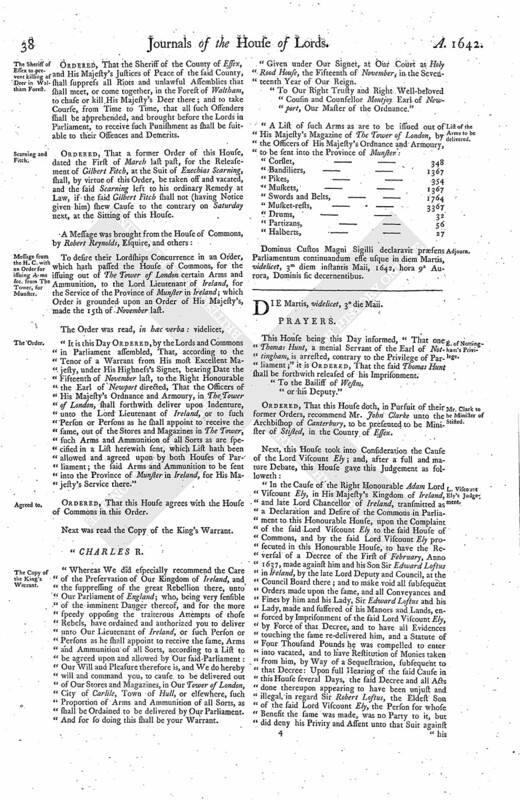 Royal Assent to the Bill for Tonnage and Poundage by Commission. 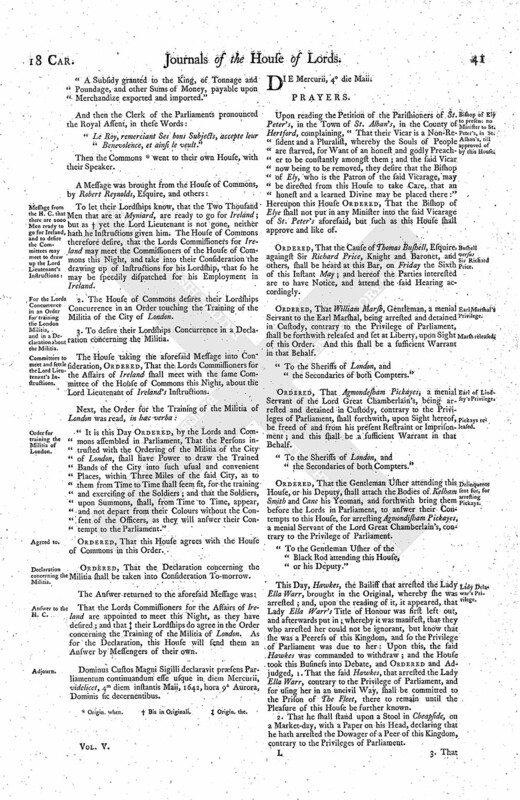 For the Lords Concurrence in an Order for training the London Militia, and in a Declaration about the Militia. Committees to meet and settle the Lord Lieutenant's Instructions. Order for training the Militia of London. This House being this Day informed, "That one Thomas Hunt, a menial Servant of the Earl of Nottingham, is arrested, contrary to the Privilege of Parliament;" it is Ordered, That the said Thomas Hunt shall be forthwith released of his Imprisonment. "To the Bailiff of Westm. Ordered, That this House doth, in Pursuit of their former Orders, recommend Mr. John Clarke unto the Archbishop of Canterbury, to be presented to be Minister of Stisted, in the County of Essex. "In the Cause of the Right Honourable Adam Lord Viscount Ely, in His Majesty's Kingdom of Ireland, and late Lord Chancellor of Ireland, transmitted as a Declaration and Desire of the Commons in Parliament to this Honourable House, upon the Complaint of the said Lord Viscount Ely to the said House of Commons, and by the said Lord Viscount Ely prosecuted in this Honourable House, to have the Reversal of a Decree of the First of February, Anno 1637, made against him and his Son Sir Edward Loftus in Ireland, by the late Lord Deputy and Council, at the Council Board there; and to make void all subsequent Orders made upon the same, and all Conveyances and Fines by him and his Lady, Sir Edward Loftus and his Lady, made and suffered of his Manors and Lands, enforced by Imprisonment of the said Lord Viscount Ely, by Force of that Decree, and to have all Evidences touching the same re-delivered him, and a Statute of Four Thousand Pounds he was compelled to enter into vacated, and to have Restitution of Monies taken from him, by Way of a Sequestration, subsequent to that Decree: Upon full Hearing of the said Cause in this House several Days, the said Decree and all Acts done thereupon appearing to have been unjust and illegal, in regard Sir Robert Loftus, the Eldest Son of the said Lord Viscount Ely, the Person for whose Benefit the same was made, was no Party to it, but did deny his Privity and Assent unto that Suit against his Father; and the Party in whose Name the Prosecution was, was therein no whit concerned; that all the Colour to warrant the Proceedings at the Council Board there, was a Petition transmitted out of England, with His Majesty's Letter, and the Cause not there proceeded in upon that Petition, but upon a much different Petition, that was grounded upon a supposed Parole Agreement almost Twenty Years before; that it was built but upon a single Testimony, and that various in itself, and was a Decree for Manors and Lands of Inheritance, of a great Yearly Value, at the Council Board; and a Settlement enforced to be made, contrary to the Prayer of the Petition, in such Manner as the same is wholly destructive to the Family and Honour of the said Lord Viscount Ely; the Inheritance of the whole Estate, in case the Decree and Conveyances should stand, being thereby devolved upon an Heir Female, the said Sir Robert Loftus being dead, and Issue male of his Body being:" It is therefore Adjudged and Ordered, by the Lords in Parliament, That the said Decree be absolutely reversed, and all Acts and Conveyances enforced thereby, or made pursuant thereto, made void; and that all the Monies, received by Force of the said Decree, Sequestration, and subsequent Orders, and paid over to Sir George Wentworth, Knight, and for which the said Sir George Wentworth gave an Acquittance to Sir Paul Davis, Clerk of the Council there, who, by Orders there, had received and paid over the same to him, shall, by the said Sir Georg Wentworth, his Heirs, Executors, and Administrators, be repaid to the said Lord Viscount Ely, his Executors, Administrators, or Assigns; and that Robert Lord Dillon, now Earl of Roscomon, Sir Adam Loftus, and Sir Phillip Manwaring, Knights, and their Heirs, who now, by their Counsel, submitted thereunto, and all and every other Person or Persons, or his or their Heirs, who shall or may claim, or pretend any Claim, Estate, or Interest, in or to all or any the Manors, Lands, Tenements, or Hereditaments, conveyed by Force, or in Pursuance, of the said Decree, or subsequent Orders there made concerning the same, shall re-convey all and singular the Premises to the said Lord Viscount Ely, or the Heirs Males of his Body, with Remainder to his Right Heirs, freed and discharged of all Incumbrances by them done or suffered, in such Manner as the Counsel of the said Lord Viscount Ely shall advise; and that such Land as hath been bought by the Lord Viscount Loftus, descendable to the Heir General, with Two Thousand Pounds, shall descend and come to Anne Loftus, Daughter and Heir of Sir Robert Loftus, and Grandchild to the said Viscount Ely, Heir General of the said Lord Viscount Ely; and, if no such Land hath been heretofore bought for her the said Anne Loftus, nor Two Thousand Pounds paid for her Use, then Two Thousand (fn. 1) Pounds, which is to be restored to the Lord Loftus, shall be deposited in the Hands of Sir George Wentworth, unto the Use of the said Heir General: And the Lord Chancellor of Ireland for the Time being, shall take Care of the Performance of this Order; and that good and sufficient Security be given, that the Two Thousand Pounds, allotted unto the Heir General as aforesaid, with the Interest and Increase thereof, shall duly and truly be paid unto the aforesaid Anne Loftus, either at her Day of Marriage, or Attainment of her Age of One and Twenty Years; and, if the said Anne Loftus shall not be married, or happen to die before she comes to Years to enable her in Law to dispose of the aforesaid Two Thousand Pounds and the Improvement thereof, that then the same shall revert and come to the Lord Viscount Ely, his Heirs, Executors, or Administrators. 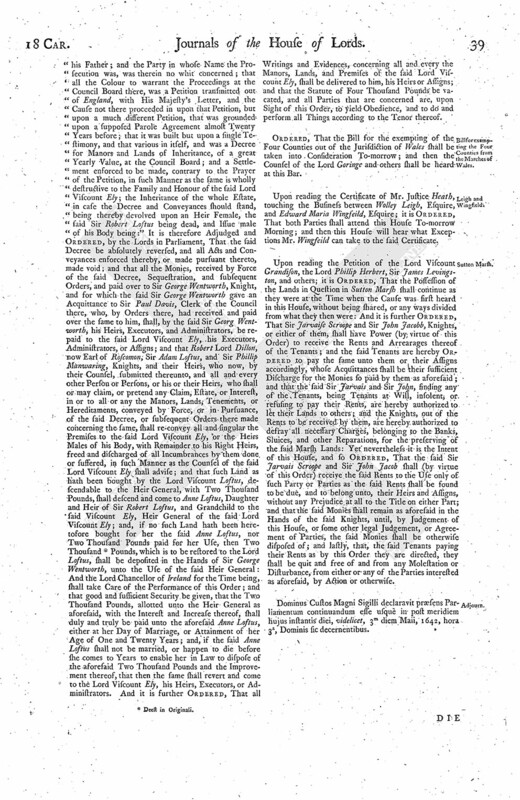 And it is further Ordered, That all Writings and Evidences, concerning all and every the Manors, Lands, and Premises of the said Lord Viscount Ely, shall be delivered to him, his Heirs or Assigns; and that the Statute of Four Thousand Pounds be vacated, and all Parties that are concerned are, upon Sight of this Order, to yield Obedience, and to do and perform all Things according to the Tenor thereof. Ordered, That the Bill for the exempting of the Four Counties out of the Jurisdiction of Wales shall be taken into Consideration To-morrow; and then the Counsel of the Lord Goringe and others shall be heard at this Bar. Upon reading the Certificate of Mr. Justice Heath, touching the Business between Wolley Leigh, Esquire, and Edward Maria Wingfeild, Esquire; it is Ordered, That both Parties shall attend this House To-morrow Morning; and then this House will hear what Exceptions Mr. Wingfeild can take to the said Certificate. Upon reading the Petition of the Lord Viscount Grandison, the Lord Phillip Herbert, Sir James Levingston, and others; it is Ordered, That the Possession of the Lands in Question in Sutton Marsh shall continue as they were at the Time when the Cause was first heard in this House, without being shared, or any ways divided from what they then were: And it is further Ordered, That Sir Jarvaise Scroope and Sir John Jacobb, Knights, or either of them, shall have Power (by virtue of this Order) to receive the Rents and Arrearages thereof of the Tenants; and the said Tenants are hereby Ordered to pay the same unto them or their Assigns accordingly, whose Acquittances shall be their sufficient Discharge for the Monies so paid by them as aforesaid; and that the said Sir Jarvais and Sir John, finding any of the Tenants, being Tenants at Will, insolent, or refusing to pay their Rents, are hereby authorized to let their Lands to others; and the Knights, out of the Rents to be received by them, are hereby authorized to defray all necessary Charges, belonging to the Banks, Sluices, and other Reparations, for the preserving of the said Marsh Lands: Yet nevertheless it is the Intent of this House, and so Ordered, That the said Sir Jarvais Scroope and Sir John Jacob shall (by virtue of this Order) receive the said Rents to the Use only of such Party or Parties as the said Rents shall be found to be due, and to belong unto, their Heirs and Assigns, without any Prejudice at all to the Title on either Part; and that the said Monies shall remain as aforesaid in the Hands of the said Knights, until, by Judgement of this House, or some other legal Judgement, or Agreement of Parties, the said Monies shall be otherwise disposed of; and lastly, that, the said Tenants paying their Rents as by this Order they are directed, they shall be quit and free of and from any Molestation or Disturbance, from either or any of the Parties interested as aforesaid, by Action or otherwise. Dominus Custos Magni Sigilli declaravit præsens Parliamentum continuandum esse usque in post meridiem hujus instantis diei, videlicet, 3m diem Maii, 1642, hora 3a, Dominis sic decernentibus. The Lord Chief Justice of the Common Pleas was appointed by this House to be Speaker. Ordered, That Publication of Depositions, in the Cause between Doctor Scott and Christopher Scott, against Ralph Cooke, shall be had and made on the last Day of this Term, being the 23d of this Instant May. Ordered, That Captain Thomas Stanley, Mayor of Maydston, in the County of Kent, being now in Custody, shall be forthwith freed of his Restraint, paying his Fees, and entering into Bond of Two Hundred Pounds unto James Maxwell, Esquire, Gentleman Usher attending this House, to appear before the Lords in Parliament within Forty-eight Hours next after Notice given him from this House. It is this Day Ordered, by the Lords in Parliament assembled, upon reading the Petition of Sir Phillip Manwaring, Knight, That the Proceedings in the Cause of Mr. Steward shall be respited here, and no Prosecution shall be against him for his Particular; but that the whole Business concerning him shall be referred to the Consideration of the Lord Lieutenant of Ireland, to examine, mediate, and end the same, as in his Wisdom he shall think fit. The Lord Viscount Say & Seale reported, "That the Committee for the Bill against Pluralities have thought fit to wave those Alterations therein which the House of Commons have not assented to, and have drawn up a Proviso concerning the Two Universities, which the Committees think fit to pass, with Amendments assented unto by the House of Commons." Then the said Proviso was read Twice singly, and afterwards the Bill was read with the Amendments and Proviso; and this House agreed to the said Bill, with the Amendments and Proviso. To let them know, that this House agrees to the Bill against Pluralities, with the Amendments, and a Proviso concerning the Two Universities; wherein this House desires their Concurrence. That the House of Commons will send an Answer, by Messengers of their own, to this Message. To desire their Lordships Concurrence in an Order passed that House, for paying of Two Thousand Pounds to Sir John Hotham, for the Garrison at Hull. 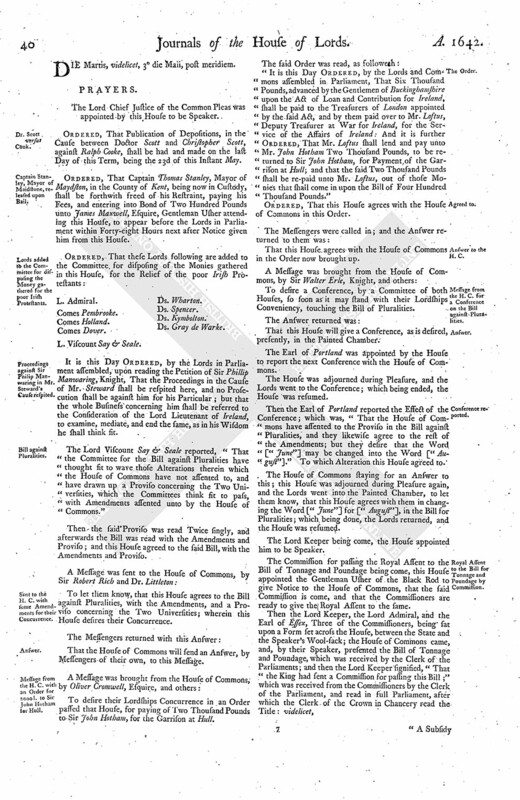 "It is this Day Ordered, by the Lords and Commons assembled in Parliament, That Six Thousand Pounds, advanced by the Gentlemen of Buckinghamshire upon the Act of Loan and Contribution for Ireland, shall be paid to the Treasurers of London appointed by the said Act, and by them paid over to Mr. Loftus, Deputy Treasurer at War for Ireland, for the Service of the Affairs of Ireland: And it is further Ordered, That Mr. Loftus shall lend and pay unto Mr. John Hotham Two Thousand Pounds, to be returned to Sir John Hotham, for Payment of the Garrison at Hull; and that the said Two Thousand Pounds shall be re-paid unto Mr. Loftus, out of those Monies that shall come in upon the Bill of Four Hundred Thousand Pounds." That this House agrees with the House of Commons in the Order now brought up. To desire a Conference, by a Committee of both Houses, so soon as it may stand with their Lordships Conveniency, touching the Bill of Pluralities. That this House will give a Conference, as is desired, presently, in the Painted Chamber. The Earl of Portland was appointed by the House to report the next Conference with the House of Commons. Then the Earl of Portland reported the Effect of the Conference; which was, "That the House of Commons have assented to the Proviso in the Bill against Pluralities, and they likewise agree to the rest of the Amendments; but they desire that the Word ["June"] may be changed into the Word ["August"]." To which Alteration this House agreed to. The House of Commons staying for an Answer to this; this House was adjourned during Pleasure again, and the Lords went into the Painted Chamber, to let them know, that this House agrees with them in changing the Word ["June"] for ["August"], in the Bill for Pluralities; which being done, the Lords returned, and the House was resumed. The Lord Keeper being come, the House appointed him to be Speaker. The Commission for passing the Royal Assent to the Bill of Tonnage and Poundage being come, this House appointed the Gentleman Usher of the Black Rod to give Notice to the House of Commons, that the said Commission is come, and that the Commissioners are ready to give the Royal Assent to the same. "A Subsidy granted to the King, of Tonnage and Poundage, and other Sums of Money, payable upon Merchandize exported and imported." Then the Commons (fn. 2) went to their own House, with their Speaker. To let their Lordships know, that the Two Thousand Men that are at Myniard, are ready to go for Ireland; but as (fn. 3) yet the Lord Lieutenant is not gone, neither hath he Instructions given him. The House of Commons therefore desire, that the Lords Commissioners for Ireland may meet the Commissioners of the House of Commons this Night, and take into their Consideration the drawing up of Instructions for his Lordship, that so he may be speedily dispatched for his Employment in Ireland. 2. The House of Commons desires their Lordships Concurrence in an Order touching the Training of the Militia of the City of London. 3. To desire their Lordships Concurrence in a Declaration concerning the Militia. The House taking the aforesaid Message into Consideration, Ordered, That the Lords Commissioners for the Affairs of Ireland shall meet with the same Committee of the House of Commons this Night, about the Lord Lieutenant of Ireland's Instructions. "It is this Day Ordered, by the Lords and Commons assembled in Parliament, That the Persons intrusted with the Ordering of the Militia of the City of London, shall have Power to draw the Trained Bands of the City into such usual and convenient Places, within Three Miles of the said City, as to them from Time to Time shall seem fit, for the training and exercising of the Soldiers; and that the Soldiers, upon Summons, shall, from Time to Time, appear, and not depart from their Colours without the Consent of the Officers, as they will answer their Contempt to the Parliament." Ordered, That the Declaration concerning the Militia shall be taken into Consideration To-morrow. That the Lords Commissioners for the Affairs of Ireland are appointed to meet this Night, as they have desired; and that (fn. 4) their Lordships do agree in the Order concerning the Training of the Militia of London. As for the Declaration, this House will send them an Answer by Messengers of their own. Dominus Custos Magni Sigilli declaravit præsens Parliamentum continuandum esse usque in diem Mercurii, videlicet, 4m diem instantis Maii, 1642, hora 9a Aurora, Dominis sic decernentibus.